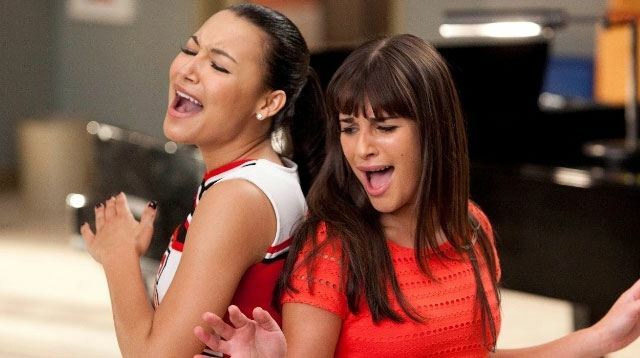 In a new interview with E!, Glee co-creator Ryan Murphy says McKinley High was home to several off-screen feuds—not just the long rumored one between Lea Michele and Naya Rivera. Without naming anyone specific, Murphy says that just like the show's rival choir groups, the men of Glee bumped heads. "There were many boys on our show that didn't get along. And you never hear about that," he says. "You never hear that in our culture." According to Murphy, the show was a "shitstorm of difficulty" for the fairly young cast. "[What] do you do when you're 18 years old or 19 years old and you wake up one day and you're world famous? I think a lot of that was informed by their youth and being involved in a phenomenon." On Lea and Naya's time on the show, Murphy says he "knows for a fact" that they "admired each other's work, 'cause I directed them both in scenes." He also says that because Lea and Naya's so-called feud lacks "decades of pain," he likely won't use their relationship for his new show Feud. (The series premiere is set for March on FX, and the first season will focus on Bette Davis and Joan Crawford's infamous battle on the set of What Ever Happened to Baby Jane?). "[If] they're still feuding at 40, I might consider it. I'll call them up in a couple years," he says of Lea and Naya. Murphy's comments come months after the release of Naya's memoir Sorry Not Sorry, in which she explains how her friendship with Lea changed on the show, to the point where Lea stopped talking to her in the final season. In the book, she writes, "I'm not offended when people offer feedback or criticism, and if things get heated on set, I try to keep perspective. We're all stressed, yes, but we're all working toward the same goal, so laugh it off and keep it movin'. Lea was a lot more sensitive, though, and it seemed like she blamed me for anything and everything that went wrong."